The news wasn’t exactly “stop the presses!” worthy, but it’s interesting nonetheless to see what the folks at YouTube are thinking about and how they are looking to improve their product. At an invitation only event last night in New York dubbed “Videocracy,” YouTube gave advertising moguls a sneak peak at some upcoming initiatives. In this day and age is it even possible to give a “sneak peak” of anything? Deep Focus CEO Ian Schafer jotted down a few notes, which he shared on his blog. Active sharing allows you to share the videos you’re currently watching with the world. Your user name will appear on the video page as you watch, and a list of the latest videos you’ve viewed will appear in your profile. Improved tools are always nice, especially for those who don’t want to mess with desktop video editing software. YouTube will be launching its own video recommendations based on your viewing preferences, sort of like Amazon Recommendations. It’s a potentially useful feature for both casual and heavy viewers alike, but YouTube already has some sort of recommendation features with star ratings and a number of views. Plus, it’s easy to embed (and share) the links of videos you like on your Website, blog, and most places on the Web. Not much of a surprise here. YouTube is showing up on everything from mobile phones to set-top boxes to large-screen TVs. Pretty soon a YouTube device will be embedded on your refrigerator door and waterproofed for shower viewing. That noise you hear? It’s marketers everywhere rejoicing. They will be able to see where video views are coming from, including sites, geography, and other data points. It will help them extract more success metrics from their YouTube efforts. That moaning you hear? That’s from the rest of us who are tired of being data mined for every video we view, every link we follow, every time we stop watching YouTube to the bathroom. What the heck are “tentpole content initiatives”? The YouTube Games — the wide, wide world of wacky sports? 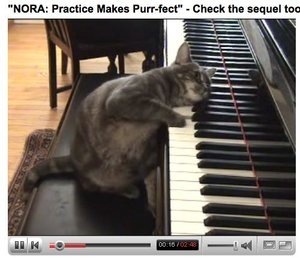 Tune into YouTube to see cats competing in the piano-playing competition? The YouTube Global Gathering — simultaneous world events broadcast on YouTube. Hosted by Bono? Thanks, Ian, for giving us all a “sneak peak” into YouTube’s plans. Now what about the high definition initiative and improved video quality? Didn’t YouTube co-founder Steve Chen say in November that high-quality streaming was coming as early as February?